From the moment I arrived at the airport in Portland, Oregon on October 19th, 2010, to the morning I boarded a plane back to New York, October 23rd, I felt that I had stepped into a world of true community. Backing up a little, last summer Chip Sammons, a Vietnam Vet and owner of The Holistic Pet Center in Clackamas, Oregon, wrote to me on my website and asked me if I would write a homecoming poem in honor of Oregon National Guard soldiers and their families for a Benefit to raise funds for the Military Family Scholarship Endowment, part of the Clackamas Community College Foundation. 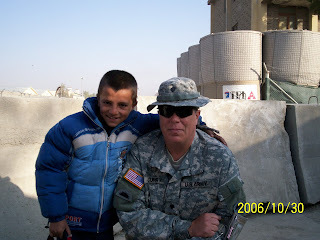 After a number of e-mails back and forth, I said I would write a poem for the event if I could talk to some National Guard soldiers and family members, thinking that would entail several 10 or 15 minute phone interviews. Twelve hours of interviews later, I realized that this had to be much more than a one or two page poem. As I expressed in the Notes at the back of the chapbook of voice poems which was born from those interviews, the only way to do justice to the men and women I spoke with and their stories, was to create a collection of voice poems drawn directly from their words. That collection became Voices of the Guard. Some of the people I spoke with for the poem wanted to remain anonymous. Others were comfortable with having their names listed as contributors in the back of the chapbook. Shelly Parini, Dean of College Advancement at Clackamas Community College, a person who cares deeply about her community and its Veterans, put me in touch with Colonel Scott McCrae (retired) and Master Sergeant Vince Jacques, who put me in touch with the men and women who consented to be interviewed. Colonel McCrae and MSG Jacques started and continue to run a Reintegration Program for taking care of Oregon’s returning soldiers and airmen. The Oregon Reintegration Program helps returning service men and women transition back into their communities and their personal lives, as well as take full advantage of the benefits due them. The Program also helps them connect with prospective employers and pathways to further education. In short, from top to bottom, from start to finish, the people I met in Oregon last week care about each other and their community, and that care and love is borne out in the actions they take every day to help each other. Oregon has suffered terrible losses in the Iraq and Afghanistan wars, as have so many communities throughout our country. The words of the soldiers and family members I interviewed and the visit to Oregon to participate in the benefit reminded me that the burden of our wars is being borne by a very few. My son is home safe, but there are thousands and thousands of young Americans who are not. In a perfect world everyone in this country would find a way to be personally involved in helping our soldiers and their family members. I saw something of that world I wish for in Oregon last week. 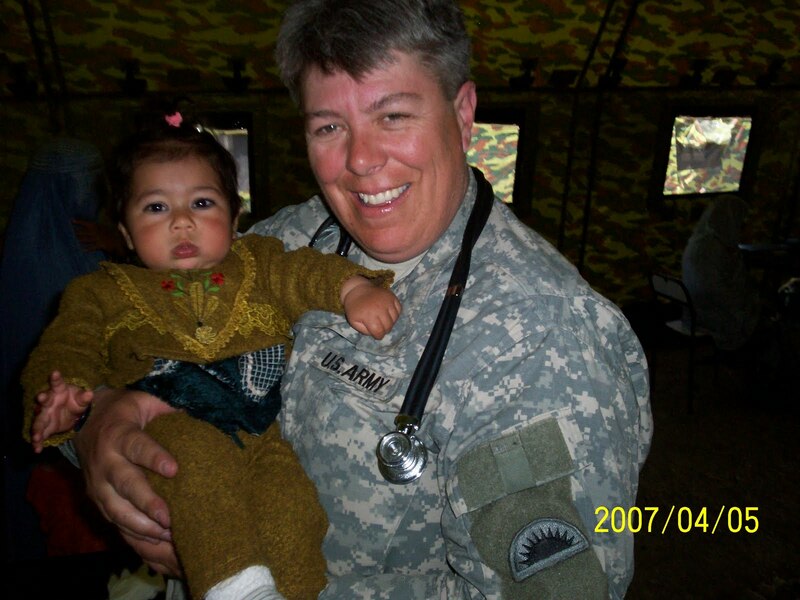 Casey Curry served as a combat medic with the Oregon National Guard in Afghanistan in 2006 and 2007. She sent me these pictures of two children she met while she was there. Casey contributed stories of some her experiences in Afghanistan to Voices of the Guard. Though I've already listed this event in another section of the website, I wanted to share this poster, designed by Kathy Smith at Clackamas Community College in Oregon City, OR, with you. 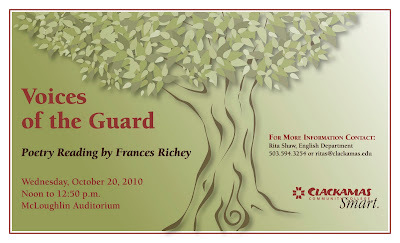 This illustration is also being used for the cover of a chapbook entitled Voices of the Guard, a homecoming poem in the words of Oregon National Guard soldiers and family members.